The knitters at Frivolite Handcrafts have come up with a cold weather accessory fit for a Hobbit. Through a series of simple images, this scarf retells Bilbo Baggins' story from the Shire and back again. When her Uncle Bilbo returned from his grand adventure, young Peony Took sat at his feet and listened to his stories. She did not laugh like the others at his wild imagination. 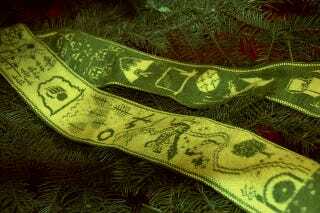 She went home and knit his entire story into a scarf, starting from his green door at home straight on through to his legendary treasure chest, and gave it to him for Christmas. Bilbo treasured that scarf and wore it every winter until it was practically in tatters, though his neighbors laughed to see his silly, impossible tale hanging round his neck. The pattern is available for $5 at Ravelry.